Avoid on the job back injuries with our improved Superior Comfort Patient Transfer Pad. The Teflon coated bottom allows the pad to slide easily so that one person can move a patient unassisted, thus freeing up other staff for other duties such as prepping the patient. The pad contains 1" of memory foam for greater patient comfort. No need to worry about cumbersome wires, tubes or expensive machines. 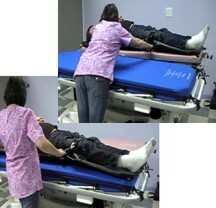 The Superior Comfort Patient Transfer Pad is low cost and easy to clean. You can have your department name digitally printed on the pad to make sure it stays in your department. Remember these safety guidelines: PAD MUST BE SECURED TO STRETCHER BEFORE TRANSPORTING PATIENT, WHEELS ON BOTH UNITS MUST BE LOCKED BEFORE TRANSFERRING PATIENT.